Phungo: Richard Pryor + Ice Cube + Julia Roberts + AFC Championship Game = ??? Richard Pryor + Ice Cube + Julia Roberts + AFC Championship Game = ??? Hey it is NFL Championship weekend! to honor the occasion we have this fun trading card from 1992. 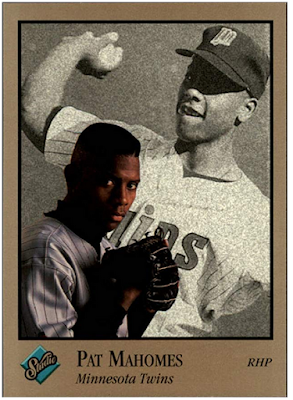 1990s MLB relief pitcher Pat Mahomes is the father of Kansas City Chiefs Quarterback Patrick Mahomes. 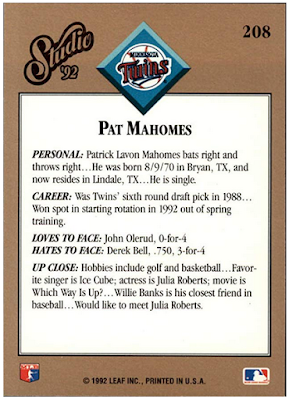 One of the early fun cards of the elder Mahomes is his 1992 Studio offering. This fine set artfully places a nice profile photo atop a black and white action shot. The idea is carried through to the reverse where fun facts regarding the player are presented rather than just your typical baseball stats. I always enjoy the pop culture connections on these cards. This set would be a great one for a card/card deep dive. I imagine there would be a lot of redundancy among the big stars of the era but this would make the outliers stand out even more. Mahomes is a cross section of early 90s and outliers. Neither Ice Cube nor Julia Roberts is surprising however I find seeing them listed together quite charming. Amazingly a quarter century later and both stars remain active, yet near as I can tell they have never been involved in a project together - unless you count Patrick Mahomes 1992 Studio card. The outlier on the card is "Which Way is Up", a 1977 star vehicle for Richard Pryor which I have never heard of previously. Apparently the film features Pryor playing a triple role - sounds pretty madcap, would love to hear a review from the peanut gallery discussing the merits of this work. Best of luck to Patrick Mahomes the younger this weekend. Anybody who has a father who digs RIchard Pryor is ok by me. Labels: 1992 Studio, Ice Cube, Julia Roberts, Kansas City Chiefs, Pat Mahomes, Patrick Mahomes, Richard Pryor, Twins, Which Way is Up? I never saw Which Way Is Up, but I remember the disco theme song by Stargard being on the radio at the time. I heard the elder Mahomes being interviewed on the radio a few months ago, and he really did seem like a good guy. Should be a great weekend of football. Go Chiefs!